Monique is the doll for you if you want to learn how to soft sculpt a face. 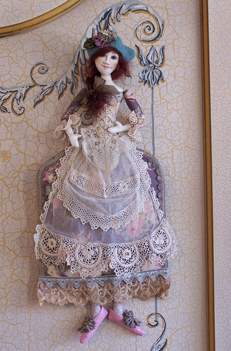 Her body construction is unique and you will have fun creating this simple but elegant style of doll making. Complete instructions for a step by step approach to developing a beautiful face with a photo gallery to help you visually as you go along. Her face is of a knit and the rest of the doll is constructed from woven cotton fabrics, laces and trims. Monique stands about 16 inches tall when done.